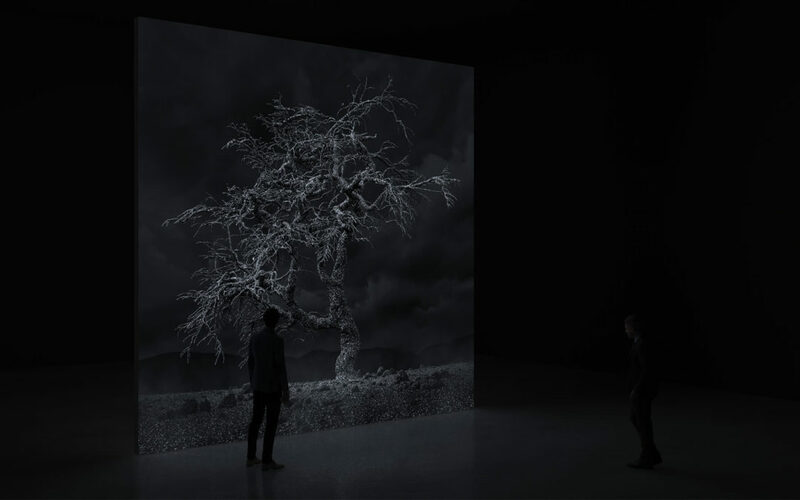 ‘Pillars of Dawn’ includes the world premiere of a new video animation alongside some of Richardson’s first works realised as digital prints rather than immersive installations. Richardson is a Canadian artist who has become internationally recognised since the millennium. She is one of the leading representatives of a new generation of artists who use digital media creatively, to craft alternative landscapes. Over the last decade she has begun dialogues with climate scientists on both sides of the Atlantic who aim to predict the various future scenarios that the planet may face, both in our own lifetimes, and in the more distant future. Her works draw upon these hypotheses whilst resembling science fiction. Characteristically, Richardson spends years to realise each individual project. Although the still images here are seen in two dimensions, they were all created as 3D model worlds in virtual space, requiring months and months, and expertise in multiple areas. ‘Sculpting’ every branch of each tree and populating the entire landscape with millions of individualised crystals has been a painstaking labour of love. Roughly speaking, there is one crystal in each of the landscapes for every species still alive today. We live in a time when many scientists believe humans are causing the mass extinction of thousands upon thousands of other species; Richardson’s work asks us what it is in the world that has value for humans. In each of the scenarios we encounter, we see a beautiful, empty, crystallised world. It is almost as though all life-forms had been transformed into pure carbon – that is, into the most concentrated forms of pure carbon in the natural world – diamonds. The majesty and infinite wealth of the Earth is revealed, although no humans appear present to appreciate it. The project has been led by Northern Gallery for Contemporary Art and is supported by Arts Council England, Newcastle University Institute for Creative Arts Practice, Southampton City Council, and the National Trust.